TMS have an enviable reputation not only for polished performances but also the variety of genres explored. Jazz isn’t new to the programme per se, but an entire concert given over to standards rather mixed with classical music is stepping into an alternative space. 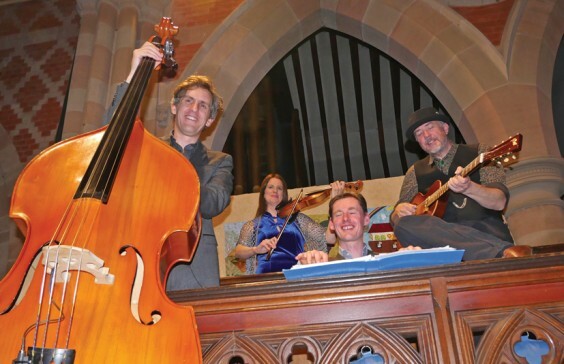 Meet Fret & Fiddle, fronted by Sally Minchin on violin and vocals accompanied by Andy Bole on guitar, Simon Smith on double bass and Rich Hughes tinkling the TMS ivories. Second number out of the blocks was a beautiful rendition of Pennies from Heaven, followed by more classics than you could shake an unnecessary baton at. Tiger Rag, Honeysuckle Rose, Night and Day – to pick a favourite was impossible as delights kept coming. F&F included blues, gypsy and, of course, dixie in their repertoire, while music by Leonard Cohen, Django Reinhardt and Stéphane Grappelli showcased the quartet perfectly. The concert title, “Jazz & Fizz”, pretty much summed up the whole experience by this accomplished group (I particular liked the violin and piano working so well together). Encore as soon as you’d like, please.